In keypad mode, most commands are repeated if key is held down, except within macros. With IRMimic2, just apply power, train the chip with the IR remote control codes you want to generate, and you’re ready to go. Code patterns are safely stored in internal non-volatile memory. The chip can be re-trained many times if needed. IRMimic2 can learn up to 57 different commands, each in a different format, if needed. In keypad mode, up to 32 PB switches, plus the “Learn” switch, can be connected. Each key controls a different command, or sequence of commands. Based on a 28-pin Microchip® PIC 18LF2420 CMOS microcontroller with EEPROM, IRMimic2 has been developed to work with most modern IR remote controls and accompanying equipment. It supports bi-phase, pulse width, and pulse position encoding techniques, as well as others. Note: If you need 16 or fewer commands, and do not plan to use macros, or will be using MCU mode, IRMimic uses the same algorithm and should work exactly the same as IRMimic2. It uses a smaller PIC chip and a smaller PC board. In addition to the IRMimic2 chip, we offer a parts kit, which includes a double-sided pc board and all components. Kit includes IRMimic2 chip, on-board voltage regulator, 38 KHz IR sensor (works with most remotes, although several modulating frequencies are used), indicator LED, IR LED, 20-pin dual row header accepts ribbon cable connector for power, control signals. 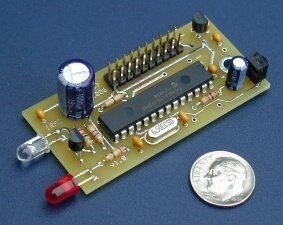 Regulator not required if 3-5V DC is available. Board dimensions: 1.25″ x 2.5″. 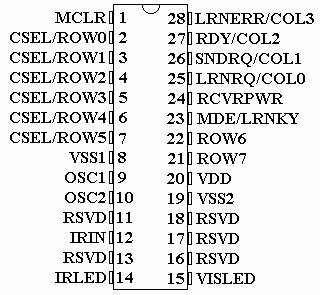 Note: You will need to connect this board to either some switches, or to a microcontroller to complete your design. Please see sample application schematics.